We are well and truly into the midst of Winter now, especially for those who live in the southern states of the country. This means we're exposed to heating when indoors, and to harsh winds and dry air when we go outdoors. All this is taking a toll on skin with the constant and abrupt changes in hot/cold temperatures. 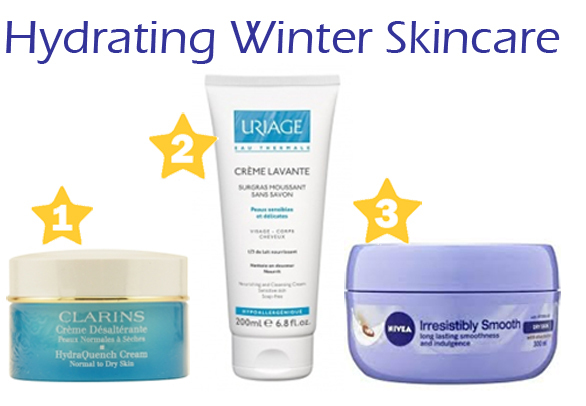 If you have very dry skin or suffer from dry patches, a hydrating moisturiser is a must during cold winter months. I love this moisturiser as it's light and requires very little effort to have it absorbed into skin. The almost gel-like creamy texture, light floral scent and non-greasiness provides instant hydration that lasts throughout the day. Great for wind or sun over-exposure, I recently used this after having my Palomar facial laser treatment and it helped to keep the peeling effects to a minimum which meant my skin recovered much quicker from the procedure. Available at Clarins counters and AdoreBeauty online. A must for those with sensitised dry skin, this non-foaming cream is more a lotion in consistency and is so gentle and non-irritating, it didn't even sting when I used it over broken skin. It does a wonderful job of cleansing and removeing oil, dirt and grimy residue without stripping moisture, leaving skin soft and smooth afterwards without any tight feeling. Made of 1/3 nourishing milk, I reserve this cleanser for my face due to its price (which then makes it amazing value) but if you need a bit of pampering, by all means go for the occasional body wash indulgence. If your skin on your body is looking parched then put the moisture back in with this beautiful soufflé cream from Nivea. Fragranced with the signature Nivea scent, this product is quickly absorbed into skin, leaving it velvety smooth without any greasy residues. The intensive and nourishing formula containing shea butter gives all day hydration and conditions skin, making this a favourite of mine for arms, elbows, legs and feet. Nivea is available at major supermarkets, Priceline, pharmacies, Target, Kmart and Big-W stores. This dry oil has captivated my senses with its exotic scent of frankincense, warm myrrh and mossy patchoulil. The golden blend of plant oil and vitamins nourishes skin, restore its elasticity and instantly softens and rehydrates, making it perfect for dry to very dry skin types. This is honestly the only dry oil I make an exception to for use on my face (I only do this in winter months as I have oily/combination skin). Endota products are available at Endota Spas and online. For stocklist, check here. Intense and luxe in feel, Kosmea's body cream is my top pick for decadent body moisturisation. Made with natural and organic ingredients with healing properties like rosehip and grape seed oil as well as shea butter, it helps to sooth dry chapped skin, relieve minor itches (perfect for my hives) and is a god-send for cracked heels. The fact that it doesn’t irritate broken skin is a bonus and can also be used on minor burn areas. Kosmea is available at Priceline, selected pharmacies, health food stores and David Jones. Bio Oil is an affordable dry oil to bring back skin vitality and helps to improve skin’s moisture barrier. It also helps that there is no greasy residue after the oil is absorbed into skin. With a blend of vitamins and natural plant oils, it has uses in softening of fresh scars and the prevention stretchmarks during pregnancy as well as for its treatment (which I have to sadly say, didn’t work for me) but my limbs just love it for maintaining suppleness. Bio Oil is avaliable at Priceline, major supermarkets, Kmart, Big W and Target. 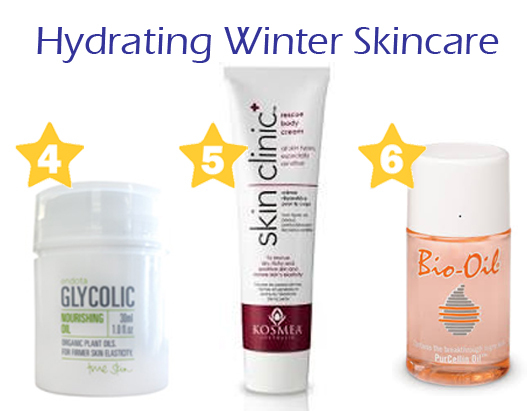 I hope this list provides some pickings for you to try if you are feeling the dryness of the winter season. I'd also love to hear how else you're keeping hydrated this winter. Until next time, stay warm! Products featured were provided for editorial consideration. Blog Refresh and New Site Coming Soon!